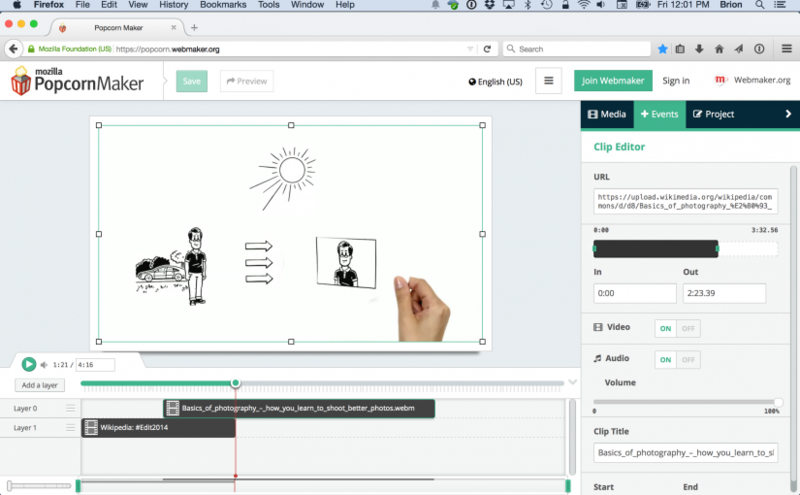 One of the really cool ‘web maker’ projects that Mozilla sponsored in the last few years was Popcorn Maker, an in-browser video editor that could take direct video clips or videos from Youtube etc and let you remix to your heart’s content. Unfortunately Mozilla has to shuffle priorities, and Popcorn Maker is on the outs. Fortunately, there’s enough interest in the Wikimedia video world that we’re helping to pick it up! If you’re interested in helping out, we’re going to have some work sprints at WikiConference USA next weekend in Washington, DC. Please come and help out! So pleased that Popcorn maker won’t disappear, great tool for open educational practice in language teaching. Is there any way we can follow developments? as we started to use and implement Webmaker for a Multimedia-Journal here in Berlin / Germany in 2014, I am interested in collaboration to bring the code and the project back to life (> 2015). Please contact me, if this sounds interesting for you.